There's a beautiful gift for every couple in this gorgeous new collection. 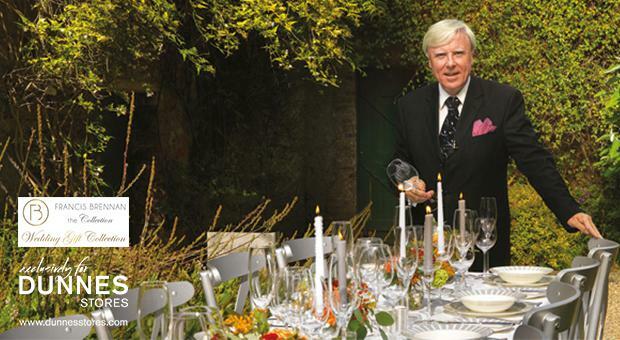 If there’s one person who knows best when it comes to incorporating both form and function, it is Francis Brennan. The much-loved hospitality maestro’s trademark style can be found within the popular homewares collections he has designed in partnership with Dunnes Stores. Now, he has brought his Midas touch to wedding gifts. The Francis Brennan Wedding Gift Collection combines his refined aesthetic with practical items that couples will love to use.For the home, he has curated a stunning collection of homeware accessories crafted from the finest materials. Think fine Italian marble accessories for the bathroom, delicate bone china for the kitchen, sleek glassware, including rounded tumblers and glistening champagne flutes, as well as luxury scented candles. For the couple who has it all, there are chic stationary sets so they can write their post-wedding Thank You notes, a classic double-layered umbrella with mahogany handle just in case there are showers on the big day and luxurious cashmere throws ideal for the plane when they jet off on the honeymoon. If you are heading to a wedding this summer, then the Francis Brennan Wedding Gift Collection will have you covered. You can see the full collection here and shop the gift guide online or in Dunnes Stores. To celebrate the launch of this new collection, we are giving away a €200 giftcard for the Francis Brennan Wedding Gift collection. To be in with a chance of winning, simply complete the entry form HERE. CLOSES SUNDAY 24TH JUNE. T&CS APPLY. THEVOW.ie To celebrate their upcoming wedding event, The K Club have teamed up with THEVOW.ie to offer our readers the chance to win a romantic retreat to the stunning country house in Kildare. THEVOW.ie Classic elegance and contemporary style in perfect balance – Benetti breathes new life into spring/summer tailoring.